Back on the cloud. Kind of nice having different instances to hop around on. Will be using toot.cat/@blogoklahoma as the alternate from now on. Google moving up sunset of Google+. Google+ API in 90 days, and the rest of Google+ in April 2019. Santa&apos;s Village - Explore, play, and learn with Santa&apos;s elves all December long. > 2-1-1 Oklahoma will enable everyone to get help or provide help. 2-1-1 Oklahoma offers information and referral across the spectrum of human need, including but not limited to rental assistance, food pantries, affordable housing, health resources, child care, after-school programs, caregiver support, financial programs, literacy, and job programs. The Supreme Court must decide the fate of a murderer—and whether roughly half of Oklahoma is rightfully reservation land. Facebook giving me all sorts of fits this morning. Keep seeing "Sorry, this content isn&apos;t available right now" So fun. 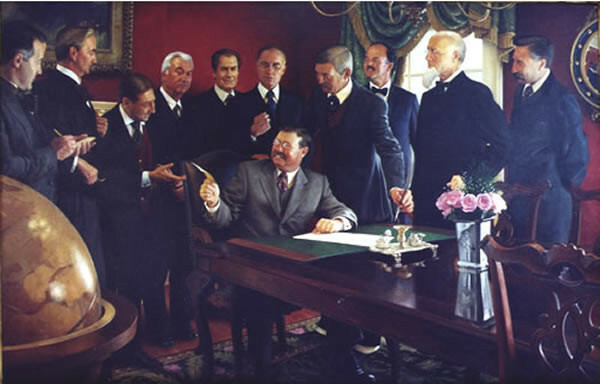 President Teddy Roosevelt Signing Statehood Proclamation. A painting by Mike Wimmer. This painting can be seen on the 4th floor outside the Senate Chamber Lobby at the Oklahoma State Capitol. Oklahoma statehood, November 16, 1907.